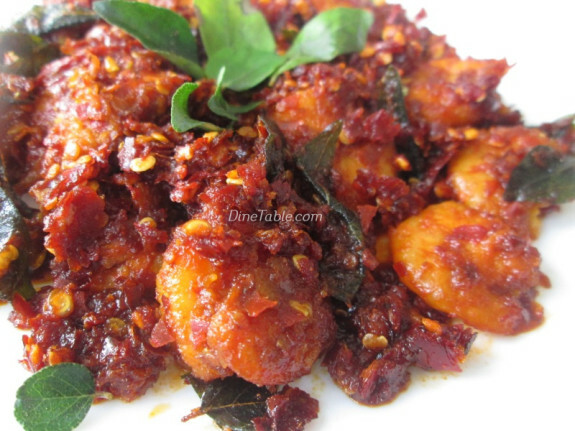 Try out the spicy yet delicious, Dry Red Chilli Prawns Fry Recipe / നാടൻ ചെമ്മീൻ ഫ്രൈ. The sight and the smell is so appealing and tempting that your entire family will be inside the kitchen tracking the smell. Try to use fresh prawns than frozen which makes your dish very tasty. The dish is a little spicy. You can increase or decrease the spiciness as you prefer. Adding lemon juice and curry leaves will give a nice aroma and flavor to the dish. It can be served with rice, chapatis, nans or any type of rotis. 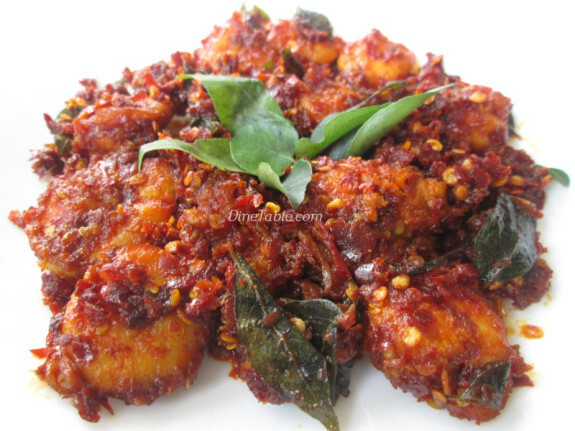 Hope you all try this spicy and delicious Dry Red Chilli Prawns Fry Recipe / നാടൻ ചെമ്മീൻ ഫ്രൈ / Nadan Kerala Style Chemmeen Varuthathu. 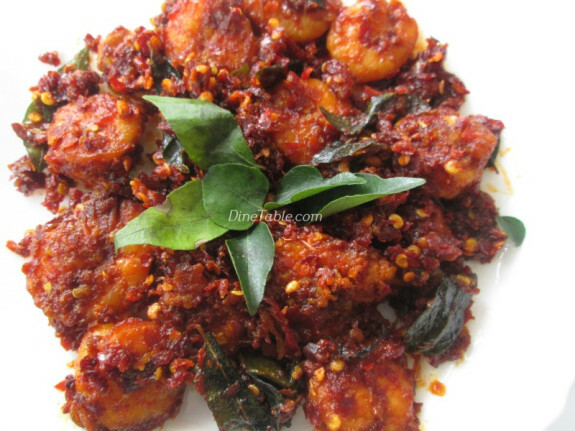 Try and enjoy..
Click here for other tasty Prawns Recipes. Grind shallots, dry red chilly, turmeric powder, salt, ginger garlic paste, kashmiri red chilly powder and lemon juice together by adding 3 tbsp of water. Marinate the prawns with this paste and keep it aside for 10 minutes. 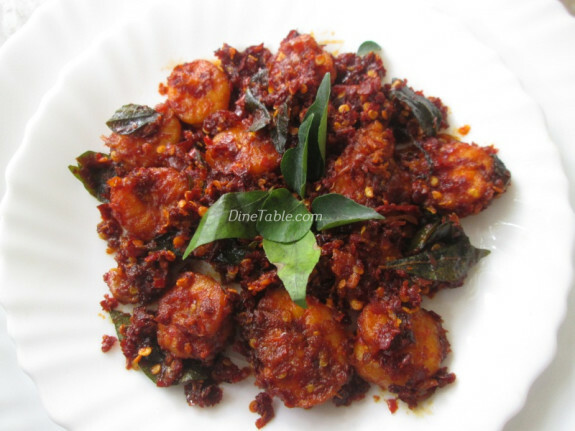 Heat 4 tbsp of coconut oil in a pan and add the marinated prawns, curry leaves and saute well. 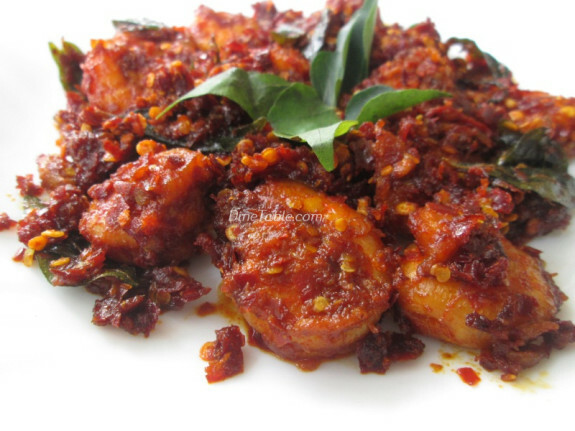 Cook till the water from the prawns has been fully absorbed and the prawns are coated with the marinade. Stir occasionally. Fry the prawns over a low heat for few more minutes till the prawns get a golden brown colour. Then switch off the flame. 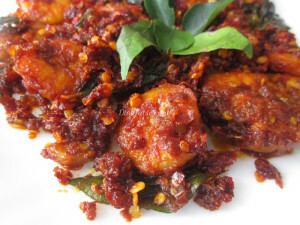 Tasty Prawns Fry In Dry Red Chilly is ready.